Before he went underground, Oscar was a clear target by Chicago’s police department because he was a well-known community leader. In 1981, he was captured under the charge of seditious conspiracy — to conspire to overthrow by force the authority of the United States over Puerto Rico. For over a hundred years it has been the independence movement that has formulated the concept of our political reality, always asserting that we are a colony. Against sea and storm, paying the price of persecution and criminalization, independentismo has affirmed, and reaffirmed, that Puerto Rico’s political status is that of a colony. It is an irrefutable truth for everyone who loves justice, freedom and truth. For 35 years, Oscar spent time in four North American prisons where different forms of abuse and torture were enacted on him. He was harassed by his jailers and was even a victim of an entrapment plan where FBI informants fabricated an escape conspiracy to put even more years on him. He was subject to solitary confinement and absolute segregation. He suffered sleep deprivation constantly. What gives me the certainty that my spirit will be reborn after this difficult test is not an enigma that must be deciphered. My certainty lies in my confidence that i have chosen to serve a just and noble cause. A free, just, and democratic homeland represents a sublime ideal worth fighting for. There is an organic relationship between my motivation to struggle and that ideal. In spite of the conditions of his captivity, he remained strong and resolute in his beliefs. What followed is a series of correspondence between Oscar and his family, his closest circle which revealed the ultimate strength of his character. Spending 35 years in prison can do a lot of damage to a person’s spiritual and mental health, but Oscar never wavered in his longing for an independent homeland. Reading his letters to his daughter, his granddaughter, friends and other supporters gave me a sense of a spiritual abundance, of what he held close time and time again. i know material poverty as i know my own hands. i know the pain caused by material poverty and spiritual poverty. i know the pain of stubbing a toe on a stump for lack of shoes to wear. i know the pain of hunger. Because i have suffered in flesh, bone, and spirit, i reject and detest material poverty as much as spiritual poverty. And maybe i detest the latter more than the former because it causes more ignorance and insensitivity. In January 2017, Barack Obama commuted Oscar’s sentence and in May 2017, he was finally released. 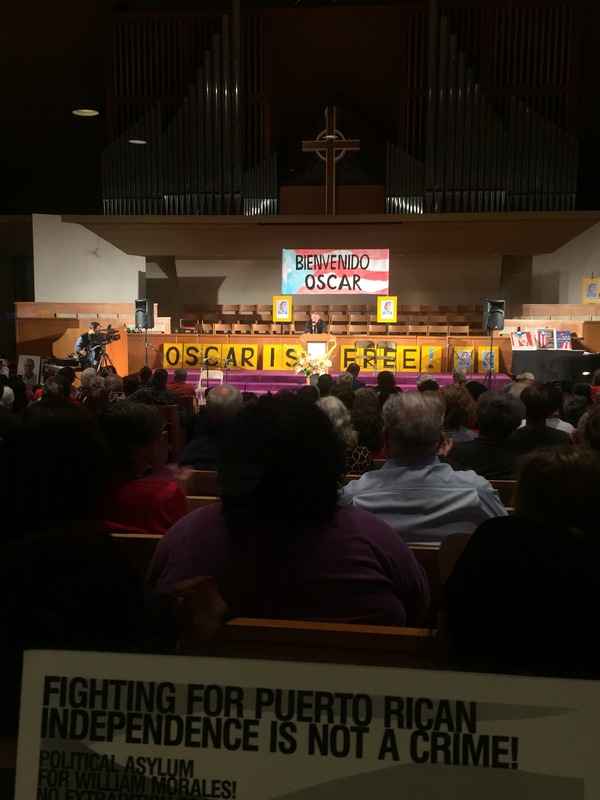 Back at the event in Berkeley, I glanced up as the crowd welcomed Oscar to the stage. Many were waving Puerto Rican flags, and I was (as always) overcome with emotion. People were wiping tears from their eyes, clapping hard for Oscar, his release and his resilience. His life and his struggle for Puerto Rican independence is an inspiration to many people like me, people engaged in anti-imperialist movements and movements of liberation. I was feeling a little bad that up until the event I didn’t know who he was and that I wasn’t able to participate in any actions to call for his release. But I learned something even more valuable, as he stood on stage, surrounded by the kinds of people I want to build movements with: that the fight doesn’t end until all political prisoners are free, until people can fully claim their homelands as their own, until the ravages of imperialism are destroyed. I never knew Oscar personally, not even from afar, but I am indebted to his words and the strength of his spirit. As he always says, pa’lante always. …i can go to bed every night with a clean conscience because there is no blood on my hands, and because my heart remains full of love and compassion. i was born Boricua, i will keep being Boricua, and will die a Boricua. i refuse to accept injustice, and will never ignore it when i become aware of it. If i can’t do good to someone, at least i will never do them harm. And if i have nothing good to say about someone, i’ll say nothing at all.